Living in Las Vegas since the 1940s, Lorraine Hunt has been an entertainer, businesswoman, a Clark County Commissioner, and the Lieutenant Governor of Nevada. Lorraine Hunt was born in Niagara Falls, New York. She relocated with her family to Las Vegas in 1943 where her parents worked in restaurants. Hunt attended Las Vegas High School and went onto the Westlake College of Music in Los Angeles, California. In 1955, her family opened a popular pizzeria on Fremont Street. They also opened a restaurant on West Sahara in the 1960s. Lorraine left the family business and began performing as a cabaret singer in Reno, Lake Tahoe, and Las Vegas. She was successful and used some of her earnings to invest in real estate in Las Vegas at the young age of nineteen. In 1968, she married a fellow performer “Blackie” Hunt. In 1972, Lorraine and Blackie Hunt opened the Bootlegger Restaurant in Las Vegas on land Lorraine had previously purchased. The Bootlegger became a landmark as it gained a following with Las Vegas strip entertainers. After years as a local businesswoman, Hunt entered local politics. She was elected to the Clark County Commission in 1994. 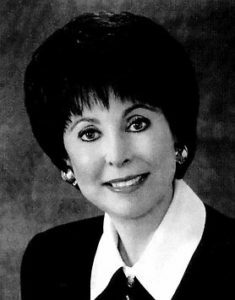 She was also became the first woman to chair the Las Vegas Convention and Visitors Authority. In 1998, Hunt ran for state-wide office and was elected Lieutenant Governor as a Republican. She won reelection in 2002. During her tenure as lieutenant governor, Hunt promoted tourism to Nevada and focused on increased economic development of the state. In 2006, Hunt sought the state’s highest office, governor, but was defeated in the Republican primary.